Image courtesy of Nano Lett. 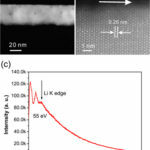 Transition metal silicide nanowires (NWs) have attracted increasing attention as they possess advantages of both silicon NWs and transition metals. Over the past years, there have been reported with efforts on one silicide in a single silicon NW. However, the research on multicomponent silicides in a single silicon NW is still rare, leading to limited functionalities. In this work, we successfully fabricated β-Pt2Si/Si/θ-Ni2Si, β-Pt2Si/θ-Ni2Si, and Pt, Ni, and Si ternary phase axial NW heterostructures through solid state reactions at 650 °C. Using in situ transmission electron microscope (in situ TEM), the growth mechanism of silicide NW heterostructures and the diffusion behaviors of transition metals were systematically studied. Spherical aberration corrected scanning transmission electron microscope (Cs-corrected STEM) equipped with energy dispersive spectroscopy (EDS) was used to analyze the phase structure and composition of silicide NW heterostructures. Moreover, electrical and photon sensing properties for the silicide nanowire heterostructures demonstrated promising applications in nano-optoeletronic devices. We found that Ni, Pt, and Si ternary phase nanowire heterostructures have an excellent infrared light sensing property which is absent in bulk Ni2Si or Pt2Si. The above results would benefit the further understanding of heterostructured nano materials. Formation of Si-Ni and Si-Pt binary and ternary phases at high temperatures were studied where Si nanowire was secured between two pads of Ni and Pt. Diffusion of Pt and Ni resulted in formation of binary phases which was shown with STEM imaging and EDS analysis.